Wonderful layout. Love the framing and all the "woody" natural embellishments. I loved this area when we visited, what a great vacation. I love this one too. I really like the wooden slats. This layout is so fresh ~ love your photo! the photo and the paper work so well because the blue of your shirts is on the opposite side of the color wheel from the orangy brown of the paper--it really pops! So nice. 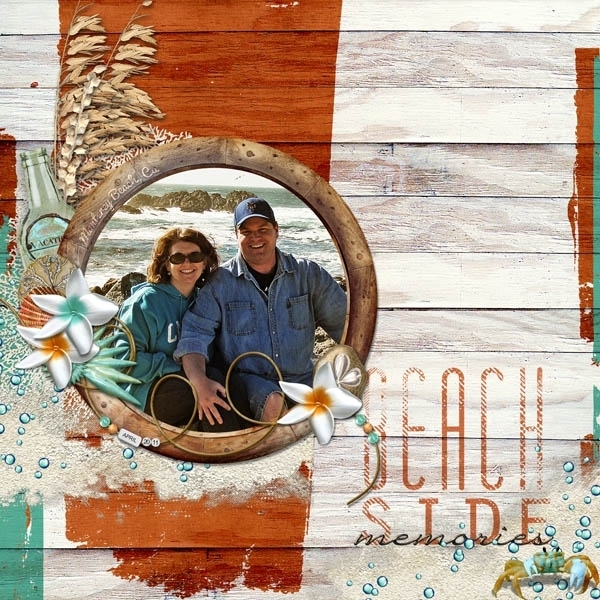 The painted and weathered boards the stem of grass seeds blowing in the breeze, the glass drink bottle and bubbles are a wonderful setting for your porthole photo. I feel relaxed just looking at it. I love the bg and the cluster frame. Lovely photo, embellishments and colors. Amazing the difference in layouts with almost the same collection. I love this - the orange and blue mask is spectacular & I really like the cluster. Wonderful photo of you & your sweetie, too.